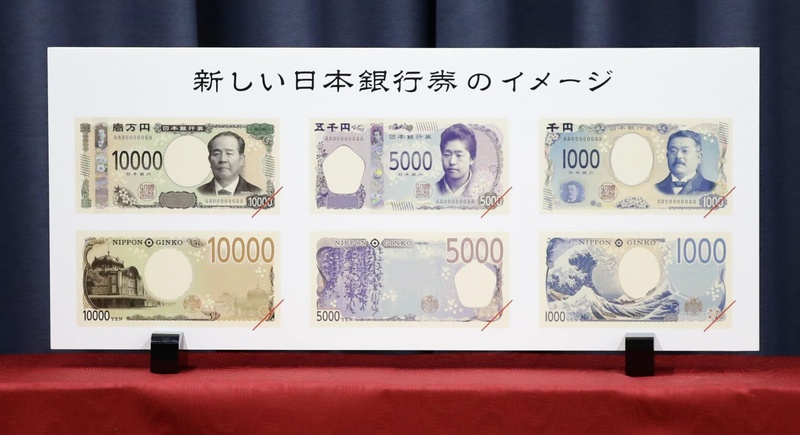 Taro Aso, Finance Minister, announced today that Bank of Japan will introduce in 2024 new banknotes of 1,000 (JPY1,000.5), 5,000 (JPY5,000.4) and 10,000 yen (JPY10,000.4). These will incorporate advanced security features, in what is the first major overhaul since 2004. 1,000 yen (JPY1,000.5): bacteriologist Shibasaburo Kitasato (1853-1931), and in the back “The Great Wave of Kanagawa” from the “Thirty Six Views of Mount Fuji” by famed uyiko-e artist Katsushika Hosukai (1760-1849). 5,000 yen (JPY5,000.4): Educator Umeko Tsuda (1864-1929), credited with advancing women’s education, with wisteria flowers in the back. 10,000 yen (JPY10,000.4): industrialist Eiichi Shibusawa (1840-1931) often called “the father of Japanese Capitalism”, and the red brick façade of the Tokyo Station building from 1914. The 2,000 yen banknote (JPY2,000.1) is not being replaced. There will also be a new coin of 500 yen. first time used new 3D holograms that appear to move when the note is tilted.